Stay tuned for more kitten pics coming soon. All of the previously posted kittens have been adopted. Take a look at the fantastic felines the are available right now for adoption! Just click on the adorable picture to the left to view the gallery! Wagging tails and wet noses are waiting to say "Hi"! Click on the picture to the right to see who's waiting for you to adopt! 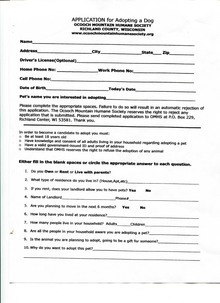 Download the application for adopting a dog, fill it out and submit it to OMHS, P.O. Box 229, Richland Center, WI 53581. If you are interested in fostering one of our dogs please download the document fill it out and return to us!